We are offering CNC Lathe Machine to our clients. 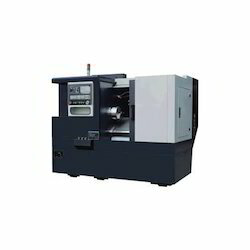 As a reputed company in this domain, we are engaged in offering CNC Lathe Machine With Cabinet & PC to our valuable clients. The complete array of the offered product undergoes various tests under the supervision of quality controllers in order to ensure flawlessness. 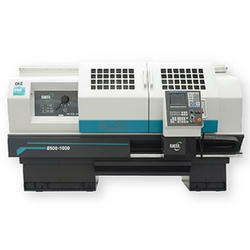 Owing to the wide experience in this domain, we are instrumental in offering Lathe Machine to our clients. - It made of fine and well-chosen materials. It has the function of Beeline interpolation, arc interpolation, MDI move, spot move, simulate move and so on. - You can create the programme by writing or by some software such as CAD, Master Cam. - It only occupy a small square of 0.5m2, you can put it in your home or office. - It’s easy to assemble, easy to learn. - Focuses on the machining features of large work pieces and duty, the bed uses the 30and 60 degree corner design being able to bear heavy cutting loading as well as keeping the axis straight. We offer CNC Lathe Machines that are fabricated from supreme grade raw materials. They are made in accordance with the latest technological developments. These machines are extensively used for the machining of hard material. We offer these machines in several models with a variety of specifications. We are listed among the top CNC Lathe Machines traders in India. Trumax Enterprises, an ISO 9001: 2008 certified company, has created a niche as India’s fastest growing CNC machines manufacturing company, with a vision par excellence to manufacture state-of-the-art products, adopting the best in technology. Adarsh CNC Services Pvt. Ltd. Tapping Machine Manufacturer , Trader , Supplier , Exporter. Twin spindle machine is designed to meet the production demands of the customers. For those who require only one job for their product i.e. either cutting or trimming or beading operation, we have reduced cycle time.